Heatwaves amplified by high humidity can reach above 40°C and may occur as often as every two years, leading to serious risks for human health. If global temperatures rise with 4°C, a new super heatwave of 55°C can hit regularly many parts of the world, including Europe. A recently published study by the Joint Research Centre (JRC) - the European Commission's science and knowledge service - analyses the interaction between humidity and heat. The novelty of this study is that it looks not only at temperature but also relative humidity to estimate the magnitude and impact of heat waves. It finds out that the combinations of the two, and the resulting heatwaves, leave ever more people exposed to significant health risks, especially in East Asia and America's East Coast. Warm air combined with high humidity can be very dangerous as it prevents the human body from cooling down through sweating, leading to hyperthermia. As a result, if global warming trends continue, many more people are expected to suffer sun strokes, especially in densely populated areas of India, China and the US. The study analyses changes in yearly probability for a high humidity heatwaves since 1979 under different global warming scenarios. If global temperatures increase up to 2 C above pre-industrial levels the combined effect of heat and humidity (known as apparent temperature or Heat Index) will likely exceed 40°C every year in many parts of Asia, Australia, Northern Africa, South and North America. Europe will be least affected with up to 30% chance of having such strong heat wave annually. However, if temperatures rise to 4°C a severe scenario is on the horizon. Scientists predict that a new super-heatwave will appear with apparent temperature peaking at above 55°C- a level critical for human survival. It will affect densely populated areas such as USA's East coast, coastal China, large parts of India and South America. Under this global warming scenario Europe is likely to suffer annual heatwaves with apparent temperature of above 40°C regularly while some regions of Eastern Europe may be hit by heatwaves of above 55°C. The authors highlight that although some urban areas such as Chicago and Shanghai are not considered to have high risk for heatwaves based on temperature only, the probability of extreme weather strongly increased when considering relative humidity. According to the study, the effect of relative humidity on heatwaves' magnitude and peak might be underestimated in current research. 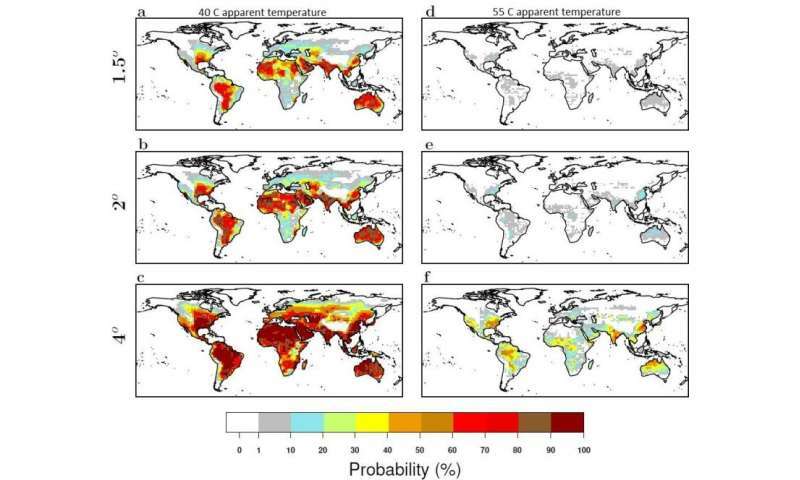 The results of the study support the need for urgent mitigation and adaptation action to address the impacts of heatwaves, and indicate regions where new adaptation measures might be necessary to cope with heat stress. The paper is published in Scientific Reports (Nature Springer) and brings valuable data and visualisations for future adaptation and mitigation policies.